I’ve had to be gluten-free for almost 10 years now. That’s no time compared to some folks, but still I’ve seen some big changes in my gluten-free lifetime. 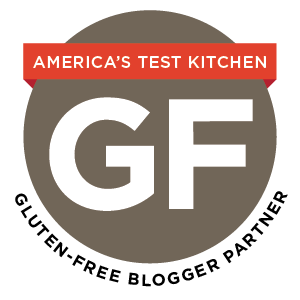 When I heard that America’s Test Kitchen was coming out with a gluten-free cookbook, I knew I was seeing another huge leap. By taking on the challenge of a gluten-free cookbook, America’s Test Kitchen, which has a reputation for rigorously-tested, rock-solid recipes, really did a lot to validate gluten-free baking and cooking as something more than a trend, something worthy of the same technical consideration as anything else in the culinary world. I was happy to see that the recipes in the book are tuned-in to contemporary concerns in the gluten-free community: using smaller amounts of xanthan gum (or none at all) and only when it’s absolutely necessary and exploring other avenues for adding structure and elasticity to baked goods, like psyllium husk and milk powder. Recipes that historically have relied on relatively large amounts of xanthan gum–like yeasted breads and pizza crust–are gum-free here. I typically shy away from gluten-free cookbooks that require you to make a flour mix as this one does. I prefer instead to bake with recipes in which the mix of flours is tailored to each specific recipe. I know gluten-free folks can go both ways on this. I think that when cooking from a number of cookbooks, as I do, having to mix up a large batch of flour for each one can feel like a big and sometimes unnecessary investment. That said, since America’s Test Kitchen set out to develop a flour mixture not only for their recipes, but one that could be used in place of all-purpose wheat flour, it felt like a more worthy investment. And–frankly–I would have been disappointed if America’s Test Kitchen hadn’t tried to tackle a gluten-free all-purpose blend. It’s something I’m glad they weighed in on. Plus, they tested each recipe in the book with two popular gluten-free all purpose flours (Bob’s Red Mill and King Arthur), providing alternatives to their flour blend to those that want it. I tested three recipes from the book, choosing the things that I’ve had the hardest time making gluten-free. I find the simplest things, those with the shortest ingredient list, are often the hardest to successfully translate to gluten-free. So, I made lemon poppy seed pound cake, shortbread, and these biscuits. All three recipes used smart techniques that ensured stellar results. 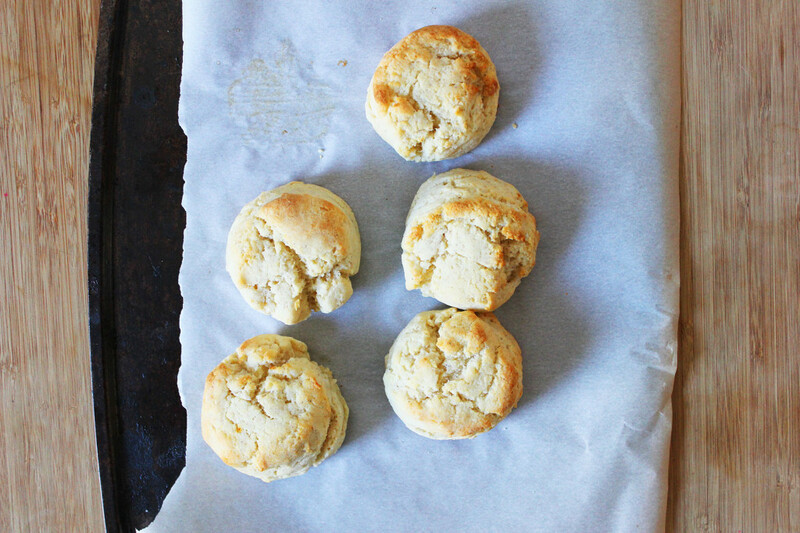 With all that gluten-free baking nerd talk out of the way, let’s talk about these biscuits. They’re pretty ridiculous. 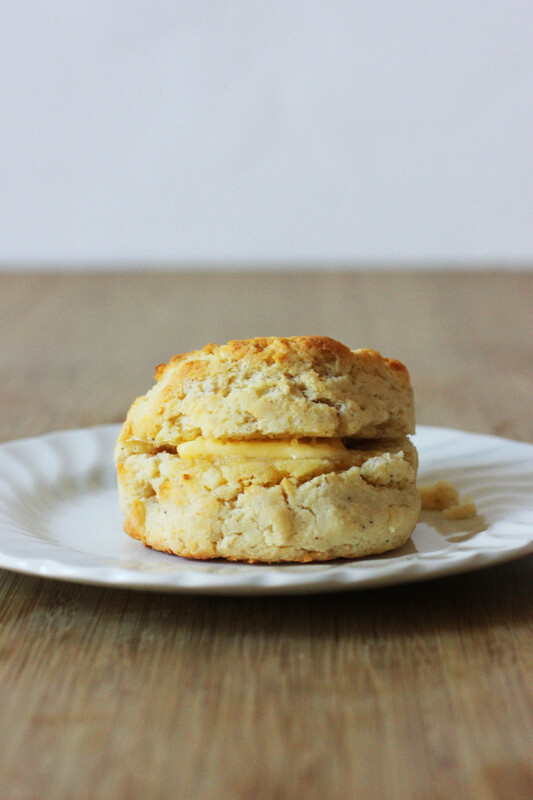 Since my mom and sister moved to the south and I became an almost-honorary southerner, I’ve had real biscuit envy. Honestly, I had no idea where to even begin to make them how I knew they should be: buttery, light, sky-high, and golden-brown. 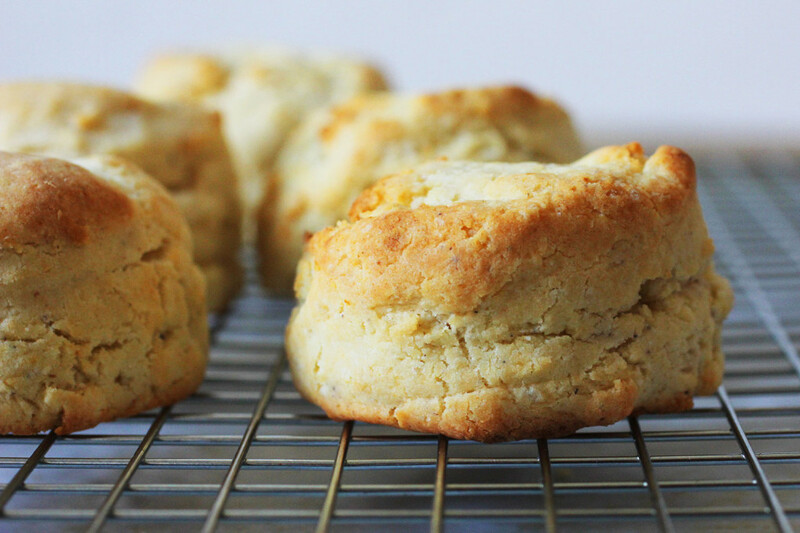 I had made gluten-free biscuits before, but they always tasted like gluten-free biscuits. These taste like biscuits. Scroll down for the recipe and plenty of chances to enter to win a copy of How Can It Be Gluten-free! 1. Whisk flour blend, baking powder, psyllium, sugar, salt, and baking soda in a large bowl until combined. Add butter to flour blend mixture, breaking up chunks with fingertips until only small, pea-size pieces remain. In separate bowl, whisk together yogurt, egg, oil, and lemon juice until combined. Using rubber spatula, stir yogurt mixture into flour mixture until thoroughly combined and no flour pockets remain, about 1 minute. Cover bowl with plastic wrap and let batter rest at room temperature for 30 minutes. 2. Adjust oven rack to middle position and heat oven to 450 degrees. Line rimmed baking sheet with parchment paper and place inside a second baking sheet. Using greased 1/3 cup dry measure, scoop heaping amount of batter and drop onto prepared sheet. (Biscuit should measure about 2 1/2 inches in diameter and 1 1/2 inches high.) Repeat with remaining batter, spacing biscuits about 1/2 inch apart in center of prepared sheet. 3. Bake until golden and crisp, about 15 minutes, rotating sheet halfway through for baking. Transfer sheet to wire rack and let cool for 5-10 minutes before serving. 1. Whisk all ingredients together in a large bowl until well combined. Transfer to airtight container and refrigerate for up to 3 months. Using Milk Powder: If dairy is part of your diet, we strongly recommend adding the nonfat milk powder. (We use nonfat, rather than whole-milk, powder because it is more readily available.) If you prefer, use an equal amount soy milk powder. You can omit the milk powder altogether, however baked goods won’t brown quite as nicely and they will taste a bit less rich, especially in recipes without a lot of fat. Buying rice flours: We used rice flours made by Bob’s Red Mill during our testing process. We found some rice flours (including those made by Arrowhead Mills, another widely available brand) to be a bit coarser, which can negatively impact the texture of baked goods. We strongly recommend that you buy Bob’s Red Mill white and brown rice flours. Giveaway ends 4 pm ET on Monday, February 24th. Giveaway for US residents only. Disclosure: America’s Test Kitchen provided me with a copy of the book mentioned above and will provide one to the giveaway winner as well. This post contains amazon affiliate links, which means I will receive a small commission form anything purchased via these links. I love Test’s Kitchen’s cookbooks and always have great experiences with their recipes. These biscuits look so fluffy!! My favorite gluten free recipe is the chocolate chip cookie I get from a local bakery here in Upstate NY. Having been gluten free for over 15 years it is nice to see that the “cooks of America” are starting to see that there are many of us that could now longer enjoy their books. Good for them for making our lives easier. I have to say that the best things I’ve ever eaten have been things that are naturally GF. But darn I love a good macaroon. The day you mentioned this on Facebook, I got the promo email from ATK and was super excited too! While I’m not gf, I like experimenting, and eating less gluten (non-sourdough gluten that is)… and my mom is going for anti-inflammatory foods, so gf baking recipes she loves are hard to come by. Thanks for the review, can’t wait to pick up a copy! My sister makes an amazing g-free flourless chocolate torte w/ berries on top… the kind of food dreams are made of! I make GF brownies for my brother-in-law that pretty awesome. They’re very chocolate-y so a little bit goes a long way. Looks excellent, and coming from ATK, you know it has to be of high quality! I have a few friends who are GF – will recommend this to them! Look at those biscuits!!! You know I love this..
Plan to buy this book for a friend who has a gluten allergy, will send her the link for these recipes now! I have the cookbook in my shopping cart on Amazon. I would love to win it instead. 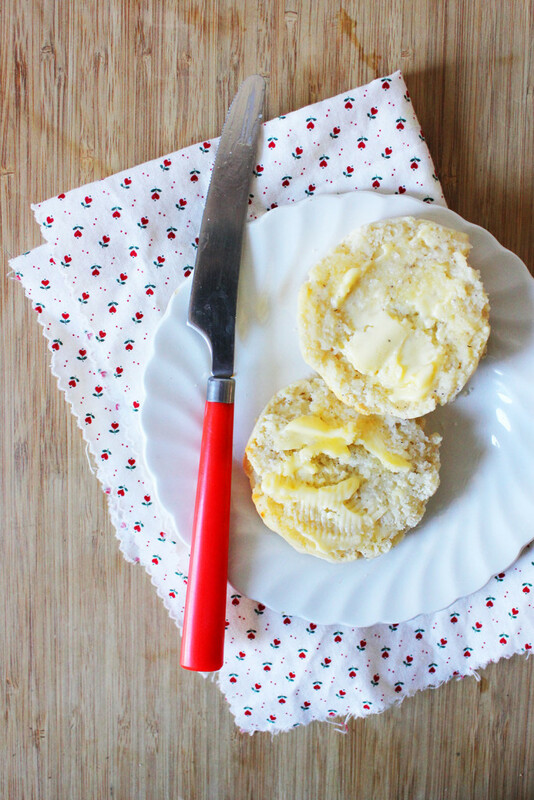 Can’t wait to try this biscuit recipe! GF Waffles at City O’ City in Denver. These biscuits (and the rest of the book) look awesome! Thanks for sharing! My husband recently went gluten-free, so I haven’t had much chance to experiment. The best thing I’ve had so far is betty crocker’s gf brownie mix! I’ve developed a lot of gluten-free recipes for several gluten-free friends, and even the non-GF guests are always amazed that what we’re having is gluten-free. The ATK GF blend looks like a good one (though it’s entirely different from my own no-rice blend), and your ATK biscuits look absolutely gorgeous! I like the way you slather on the butter! My friend Kara makes amazing gluten free brownies, but she won’t tell me what her secret is! Like others have commented, I tend toward items that are naturally gluten free instead of seeking substitutes. I am excited that ATK has tackled this topic and am very interested in the results. This is the first gf cookbook in which I feel complete confidence, because it’s from ATK. Thanks a million! The best gluten-free thing I’ve eaten is a flourless chocolate cake. I can’t wait to try these! I wish I could do dairy so that I could have the authentic thing, but hopefully mine will turn out just as good as these. They look incredible! Thanks for the recipe. I forgot to tell you what the best gluten free thing I’ve ever eaten is… It is probably my mom’s gluten free chocolate cupcakes. She tested them out several times to come up with a perfect one. So sweet of her! Cupcakes! !Vanilla with a cream cheese frosting. I can’t wait to try this recipe and check out the cookbook! I love King Arthur’s gluten free chocolate cake mix…would never know it’s gluten free! I love a good gluten-free brownie!!! Best gluten-free thing I’ve eaten (so far) is flour-less peanut butter cookies. I think the recipe was from Real Simple. Didn’t think gf could be so light. Definitely going going to try. One of my best friends has recently developed a gluten allergy that actually makes her break out in hives when she eats anything with gluten in it. I’d love to win this so I can make more things for her to eat when she comes over! The best GF recipe I have used has been a banana bran bread recipe from an old cookbook that I’ve adapted using Bob’s Red Mill & a smidge of almond flour and get the best results with if I turn it into muffins. I can use the same formula for pumpkin, banana, or apple muffins with a fantastic result – and recently figured out that by hitting the wet ingredients with a stick blender ahead of time helps to give the muffins extra light & fluffies. I won’t lie – this America’s Test Kitchen cookbook looks absolutely amazing. It’ll be the first one I buy willingly, that’s for sure! I love to bake and my favorite thing to make now that I am gf is flour-less chocolate cake with espresso whipped cream and berries on top. Delicious. I watch America’s Test Kitchen everyday and was diagnosed with Celiac’s 2 years ago – the perfect marriage for my love of cooking and gluten free has been made! These biscuits look like the real deal. Have you tried making them dairy free. I would probably try using coconut oil for the butter and then a coconut milk yogurt. Those ingredients as substitutes seem to work the best for me when baking. Can’t wait! I have not tried, Alex, but I think your instincts sound right on. Let me know if you try. You could also try subbing in goat milk powder for the milk powder, if that’s something you can tolerate. Thank you! In reply to Sandie, your friend may have an allergy to wheat as breaking out in hives is a fairly typical allergic reaction. One is not allergic to gluten as such. If one reacts to gluten it is more likely celiac disease or non celiac gluten sensitivity. These are auto immune disorders, not allergies. She may be avoiding all guten without needing to. Suggest testing for wheat allergy. Mine do not look like yours or the pic in the book ! I just made them and followed the recipe as exactly as I could but not as pretty. They taste pretty good tho. I seem to be obsessed with trying to make a decent GF biscuit. This is fourth recipe I have tried. I have this cookbook, and the first thing I made were the biscuits. They turned out just as promised, light and fluffy inside and just the right amount of crisp on the outside. I’ve made the strawberry pie, the waffles (you will never find a better waffle anywhere, gluten free or not) and the banana bread. All were excellent and enjoyed by my entire family, whom are not GF. I’ve frozen the biscuits, the waffles and the banana bread and reheated all of them with terrific results. I’m excited to keep trying new recipes from the book, and very thankful that ATK took the time to produce it! Just made the biscuits this morn and I’m not sure what went wrong. Dough did not hold together at all and wound up mostly as crumbles. Any idea what I did wrong? Any hints? I’m so sorry to hear that, Beverly. I’m really not sure since I know this is a thoroughly tested recipe since it comes from America’s Test Kitchen. Did you make any substitutions? I know I’ve tried to sub in greek yogurt in this recipe and because it has so much less liquid than what the regular yogurt the recipe calls for, I needed to add in some extra liquid to compensate. I have the cookbook and I LOVE it! 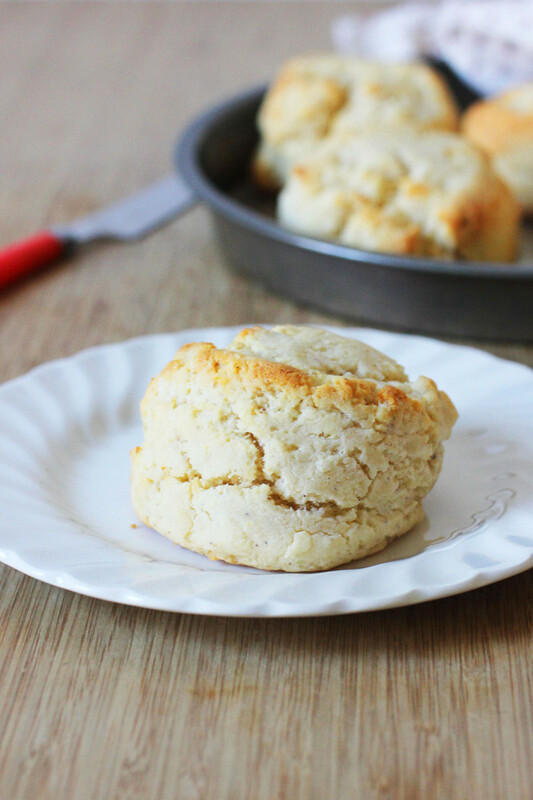 I made these biscuits last night with their “Sweet biscuit” adaptation (up the sugar to two tablespoons) for strawberry shortcakes. I didn’t have whole milk yogurt, so I used fat-free Greek yogurt, plus an extra egg yolk and only a teaspoon of lemon juice. Rave reviews from all testers, and I’m the only one who eats gluten-free! 9oz is not 2 cup. 1 cup equals 8oz so 2 cups would be 16oz. Making for first time for Thanksgiving. Can they be made ahead? Like all GF baked goods, these get stale a lot quicker than those containing gluten. I’d make them as close to when you’re going to serve them as possible. If there are too many other things vying for your time and oven space on Tday, I’d definitely re-heat them if you end up making them in advance.